As a Believer, there are times when it seems like God is leading you into a place of desolation or “wilderness” where there seems like there’s no way out. But God specializes in bringing the dry and desolate places back to life. And to do this you only need one thing – the Word of God! 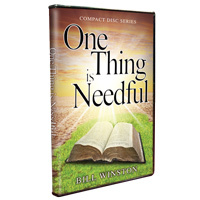 In the series One Thing is Needful Dr. Bill Winston explores the deep biblical truths surrounding the Kingdom of God’s unlimited rejuvenating power to turn any situation or anyone’s life around – forever!